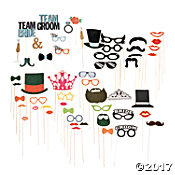 You spent long hours planning your perfect day and your photo booth should match. Let us match your invitation, style or event theme on all the photo booth screens. Our standard props are awesome or if you got something in your mind%u2013 you name it, we can make it! We designed you templet specifically to your needs. We have lots of layouts available to be customized to match your wedding style. We make your template just for you! With more than 11 elegant backdrop we will make sure match your even. Let us Know How Can We Help You On This Special Moment!